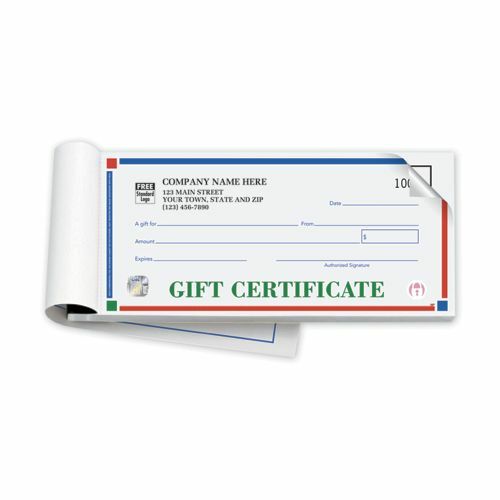 High Security Colored Printable Gift Certificates HSD854B At Print EZ. High Security Colored Printable Gift Certificates Item No. HSD854B Size: 7 3/4" x 3 3/8"
Give your customers the ease and convenience of offering these printable gift certificates without any risk of fraud. When you choose the high security printable gift certificates we have to offer, you can be sure there is every security measure that there is to make sure that the gift certificates are a safe and secure way to offer gifts to family and friends. The reality is that there is a vast majority of people who visit stores looking for gifts for acquaintances but find it difficult to come to a decision. Make sure they do not leave your store without a gift. In fact you may be able to offer the best gift possible by offering these printable gift certificates.